Students live within a hierarchical social structure made up of classrooms, grades, schools, districts and so forth. Students who share the same environment and experiences tend to be more homogeneous with each other. It has been understood and proven that ignoring this aggregation when using conventional statistical methods may produce very misleading inferences about relationships among variables (e.g., misidentifying variables associated with school achievement, which can lead to the misallocation of resources from schools). Therefore, it is always desirable to take account of the impact of hierarchies on students’ achievement and other correlated variables. 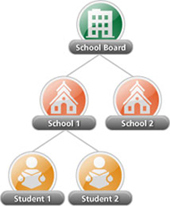 The figure to the right illustrates a hierarchical social structure, as an example, in which students are nested within schools and schools are nested within a school board. HLM (Hierarchical Linear Modeling) is a sound and useful statistical procedure for handling the complexity in hierarchical nested data which naturally exists in the educational system. It separately looks at the relationship between school and student variables with educational outcomes and therefore produces more accurate and reliable results. The results from an HLM analysis provide rich information for policy makers when making evidence-based decisions for improving the educational system. It has been highly regarded and widely used in education as well as other social science areas. 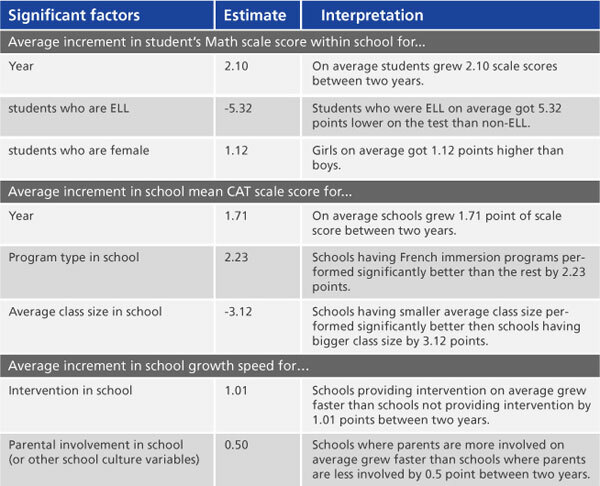 performance between various types of schools. Grade 7 CAT•4 Math achievement for school board A.
Osborne, J. W. (2000). The advantages of hierarchical linear modeling. Practical Assessment, Research & Evaluation, 7(1).